An exhibition showcasing the newly discovered documents confirming Vietnam’s sovereignty over Hoang Sa (Paracel) archipelago opened in the central city of Da Nang yesterday, January 20. The exhibition, the biggest of its kind to date, includes 125 collections of maps, three atlases and 102 books published in Western countries during the 18th and 19th centuries. The documents, originally in English, German, French, Spanish, Italian and Dutch, and translated into Vietnamese, affirm Vietnam’s sovereignty over Hoang Sa and Truong Sa archipelagoes. Scientific studies such as ‘Vietnam’s Hoang Sa archipelago through archived documents of the Government of the Republic of Vietnam (1954-1975)’ and ‘Documentary fonts on Vietnam’s sovereignty over Hoang Sa Island District-Da Nang City’ are also available to visitors. Visitors can also see the maps ‘Hoang trieu truc tinh dia du toan do” (Chinese administrative map of provincial boundaries published under the Qing dynasty); ‘An Nam dai quoc hoa do’ (Map of the Great Country of An Nam- former name of Vietnam); and ‘Dai Nam thong nhat toan do’ (Complete Map of Unified Dai Nam), as well as maps of Indochinese weather stations. The month-long exhibition showcases three atlases and 30 of the 150 maps donated by Tran Thang, an overseas Vietnamese living in the US. They were published in the UK, Germany, Australia, Canada, the US and Hong Kong (China) from 1626-1980. Among these maps, Asia and Southeast Asia commercial and maritime maps depict Hoang Sa and Truong Sa as lying within Vietnam’s maritime sovereignty. 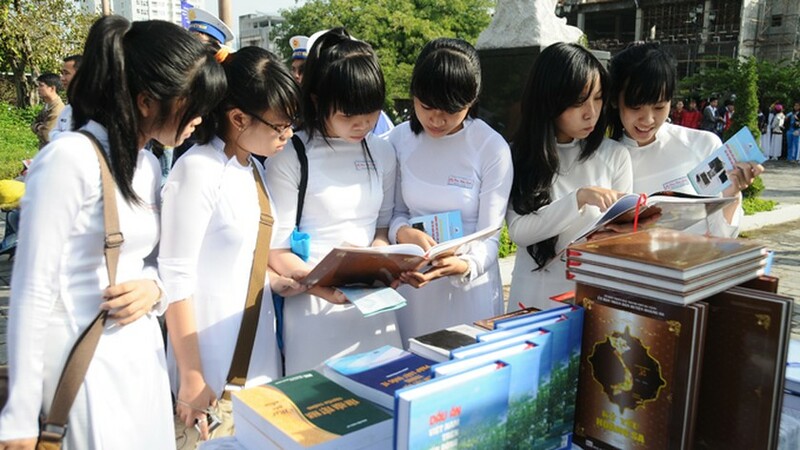 The exhibition attracted the participation of all classes of people, school pupils and intellectuals, Navy soldiers, Military Command and Border Guards of Da Nang. The exhibits are testaments of history--of witnesses who lived and conducted the task of protecting Vietnam’s Truong Sa and Hoang Sa Islands. The exhibition ends on February 20.